When I first made this recipe I was stunned to discover it was one of the most incredible bites I’ve ever had. As designed, the salsa was meant to be served on a toasted baguette but I could have just eaten it like cereal from a bowl. Yes, the salsa was that good! It was sweet, salty, a little spicy, refreshing, cool, and finished with a perfect undertone of acidity. Sounds great, right? I suspect before lunchtime tomorrow, you’ll be busy making this sophisticated salsa yourself. I am always on the look out for new recipes and inspiration — so when I had the chance to take a cooking class and pick up a few amazing tricks and recipes, well by gosh, I decided to do just that! 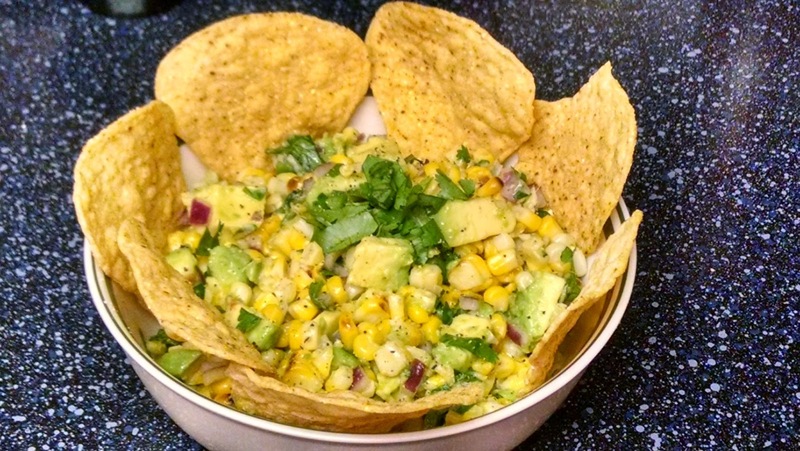 About 8 months ago or so, while attending a couples cooking class, we were tasked with making Roasted Corn and Avocado Salsa. Ready to do this? Here we go! 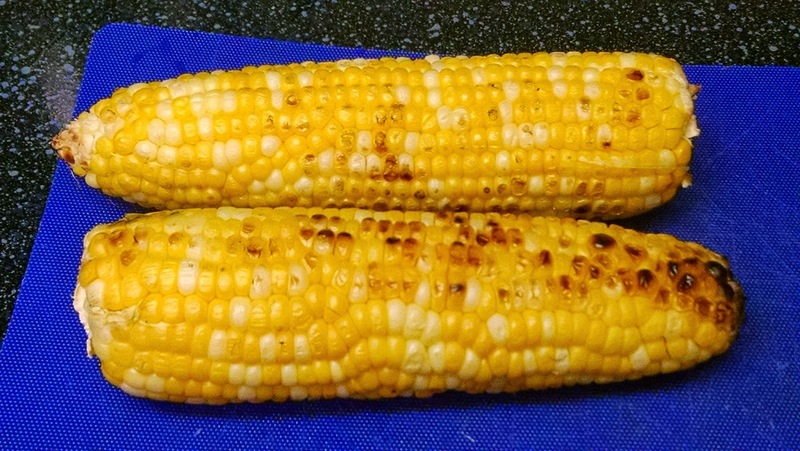 Roast two ears of corn, if you need a refresher, please review “Not Your Mama’s Corn” for how to roast corn on the grill. 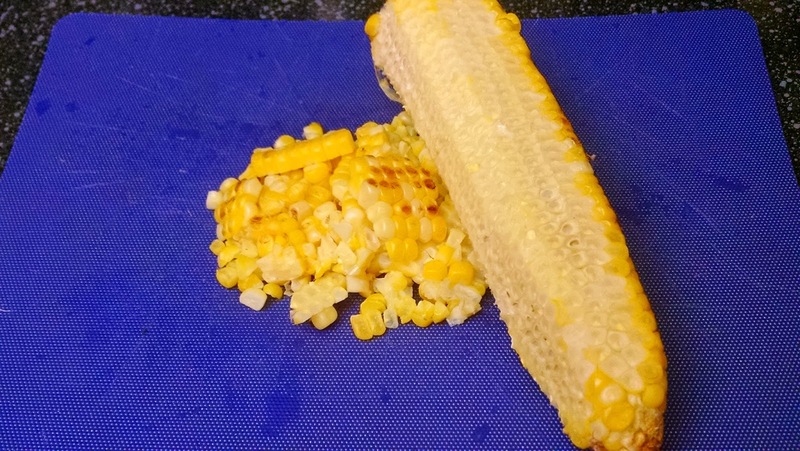 After your corn has cooled, cut kernels from the cob. Combine all the listed ingredients into a bowl. Add the avocado last so the chunks don’t break up too much. Also, if you are making this ahead of time for a picnic or BBQ and aren’t going to serve the salsa immediately, I advise leaving out the avocado until the last minute so it retains that beautiful color and buttery texture. If you plan to serve more than 2 or 3 people plan to double or triple the above recipe. 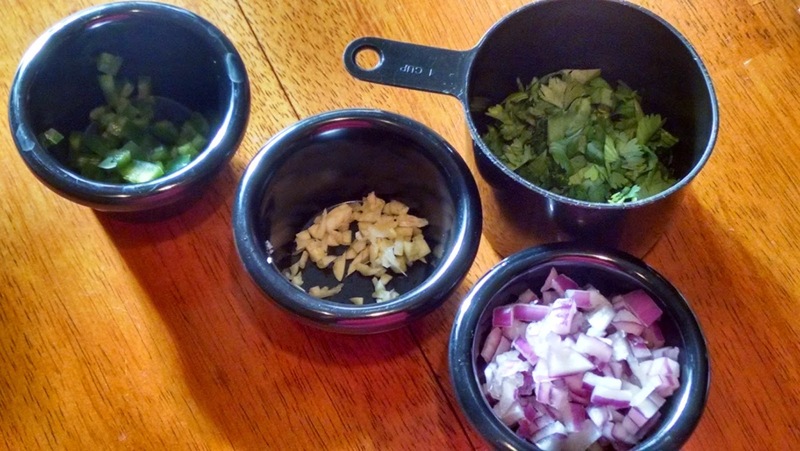 Adjust any seasoning levels to suit your tastes or preferences. Couldn’t be simpler, and once you taste the completed salsa it will be like a rumba in your mouth. Time to look at some photos! First up, you want to roast this corn. 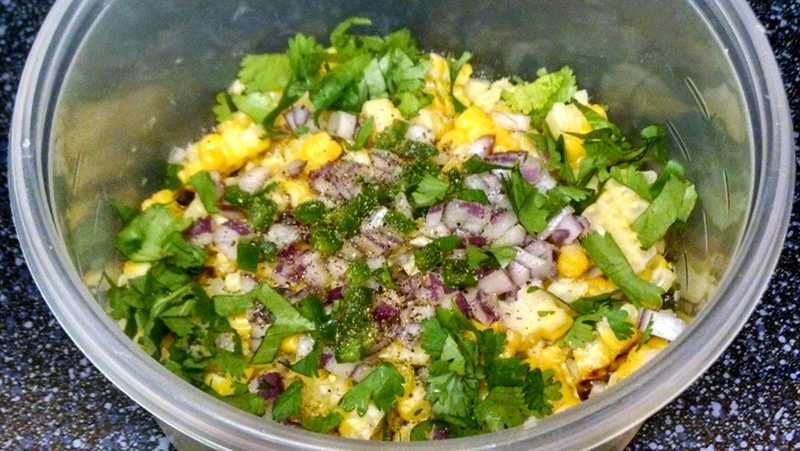 We aren’t looking to cook it all the way through, we just want to get some char and color on the corn because we still want that burst from the fresh corn kernels to go with some of the charred bits within the salsa. Additionally, the fresh and charred kernels are a nice compliment to the rest of the ingredients. Take the corn off the cobs with either a knife or you can use a mandoline. No, not the musical instrument (although those strings could help remove the corn!) but please use only kitchen devices for cooking. If you want more information, here is a useful link http://en.wikipedia.org/wiki/Mandoline. The kernels do tend to escape when you cut them free, so place a kitchen towel under the cutting board to make it easier to catch the kernels. OK, here is a shot of all the ingredients minus the avocado. It is a really important component to the salsa, but avocado tends not to hold up very well after the first day if you have any leftovers. If you don’t mind a little oxidation or losing a little texture of the avocado, then you won’t really have any problem. Just keep in mind it won’t look as pretty as the when you first made it. If you are making this ahead of time to take to an event or party, just process the avocado on site and you won’t have an issue, and you can get the wow factor that it deserves. So, how should it look when it is finished? Here is your completed dish. Make sure to check the seasoning on this as it does have a lot of complex flavors. What can you do with this versatile salsa? Well, you can use it as a dip for chips — which is amazing by the way, use it as a substitute for salsa on taco night, serve it up on some toasted baguette slices, use it as as a quesadilla topper, throw it on any greens to wake up an otherwise mundane salad, and you could top a burger with it. Once again, the options are endless, but I know this will be a great recipe you can come back to time and time again. Plus, it is a great dish for ushering in the Memorial Day weekend. On that note, my deepest thanks to all who have made the ultimate sacrifice in our armed forces to protect what we hold dear to our hearts.